In tone, tenor & content, Modi’s state election speeches have changed a lot since 2014 & become increasingly negative. New Delhi: Rahul Gandhi was once “shehzada” (prince), now he’s become “naamdaar” (dynast). But that’s not the only thing that has changed in Narendra Modi’s campaign speeches between 2014 and now. An analysis of Modi’s speeches from the Lok Sabha election campaign in 2014 and in 10 major state election campaigns since he became Prime Minister reveals that while his aggression and Congress-bashing have remained intact, most other things have seen varying degrees of change. The states considered in this analysis are Maharashtra, Bihar, West Bengal, Assam, Uttar Pradesh, Gujarat and Karnataka, as well as the currently poll-bound Madhya Pradesh, Chhattisgarh and Rajasthan. Gone are monikers like “Madam ji” and ‘Baazigar”, which he had used to mock Sonia Gandhi and son-in-law Robert Vadra respectively. Also gone is much of the wit and humour he exhibited in coining punchlines like the “three AKs Pakistan loves — AK-47, A.K. Antony (the UPA-era defence minister) and AK-49 (a reference to Arvind Kejriwal’s 49 days as chief minister)”. Instead, there is more negativity, more blame for past Congress governments, and a bitter, sarcastic tone, as was on display in Chamarajanagar, Karnataka, in May 2018. Rahul Gandhi had “challenged” the PM that if he spoke in Parliament for 15 minutes, Modi wouldn’t be able to sit in front of him. Then, he went on to challenge Rahul Gandhi to speak for 15 minutes without a paper in hand about the Congress government’s achievements in the state in any language he liked — Hindi, English or his “mother tongue” (Italian). “In those 15 minutes, you should refer to Vishveshvarayya’s name at least five times. If you do this much, the people of Karnataka will decide how much weight your words carry,” Modi had said. The reference to legendary engineer Sir M. Vishveshvarayya came because the Congress president had mispronounced his name during a rally in March, and the video clip had gone viral. Santosh Desai, MD & CEO of Futurebrands, a brand and consumer consultancy company, said this indicates a certain defensiveness, some of which can be attributed to the change in the power dynamic. “From a challenger then to an incumbent now, I have observed a certain defensiveness in Modi’s campaign pitch. In the run up to 2014, his speeches were a clever mix of what was wrong with the existing government, a forward-facing development agenda, and a bit of communal rhetoric,” Desai said. Now, the overall negative tone of the campaign and the use of the communal card are more pronounced, he said. “In the run-up to 2014, Modi’s speeches were looked upon as inspirational. It was his ability to talk to people beyond his core base that drew in the crowd. Not anymore. Barbs and attacks on opponents have become the dominant element of his campaign rhetoric,” Desai said. Also read: What’s the point of listening to Modi’s Independence Day speech if we’ve to fact check it? In 2014, Modi’s speeches revolved around building hope, catering to people’s aspirations. Invariably, in every election rally, he talked about development, creating jobs and fighting corruption. Obviously, now that he’s been in power for four-and-a-half years, he cannot follow the same narrative, so Modi has shifted to blaming the Congress for historical blunders, with the clear implication being that one term in office is not enough to right all those wrongs. He also pulls out the report card for his pet policies — Jan Dhan Yojana, Mudra Yojana, Pradhan Mantri Awas Yojana, Ujjwala, Beti Bachao, Beti Padhao etc — to show all the changes that his administration has rung in to make people’s lives better. In states where non-BJP governments were in power, he has tried to show that they failed to take advantage of these schemes. In Bihar, Modi spoke about how the state has failed to use the special package given by the Centre, and how people had to decide between jungle raj and vikas raj. In UP, Bihar and Madhya Pradesh, three of India’s poorest states, he has spoken at length about the need to create more jobs as joblessness is resulting in large-scale migration. He has also spoken at length about farmers’ plight, and how his government has introduced schemes such as crop insurance and soil health card to help them. Explaining this transformation, academic and columnist Shiv Visvanathan said: “In 2014, Modi was melodramatic and obsessive about being PM. He was a campaigner then, now he is a leader. It is unnecessary now for him to become melodramatic. Modi’s frequent references to his humble beginnings as a chaiwallah and to the Gujarat model of development — referring to his 12.5 years as chief minister — have almost disappeared or have been only passing mentions. The most prominent reference to ‘chaiwallah’ came in Assam, where Modi spoke about the plight of tea estate workers. Instead, Modi now projects himself as a “poor mother’s son”, drawing a contrast to Rahul Gandhi’s dynast identity. Caste has also become increasingly important to his speeches as the BJP has gone about adopting Dr B.R. Ambedkar as one of its heroes. Addressing a rally in Aligarh in February 2017, Modi said those who play vote bank politics in the name of Dalits have meted out a lot of injustice to Ambedkar. “Babasaheb Ambedkar did not get the Bharat Ratna as long as the Congress was in power. The Congress and those who support it don’t have a right to do politics in Ambedkar’s name,” he said. Also, Modi’s habit of referring to himself in the third person has also all but disappeared over the years. 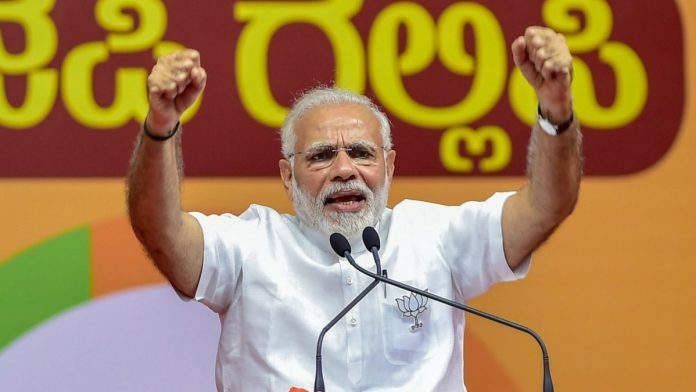 Political observers of Modi’s campaign style say that since 2014, his speeches have become more provocative, bordering at times on being outright communal. They point towards the controversial comment he made at a rally in Fatehpur, in the run up to UP polls, where he said if the state government makes a kabristaan (graveyard) in a village, then a shamshaan (cremation ground) should also be created. “Bhedbhaav nahin hona chahiye (There should be no discrimination),” he had said. On the issue of the Ram temple in Ayodhya, Modi has only spoken selectively — he addressed the issue in Gujarat last December, and more recently, in Alwar, Rajasthan, where he accused the Congress of deliberately delaying the hearing of the Ayodhya case. Sanjay Kumar, director at the Centre for the Study of Developing Societies, called it a very clever strategy where Modi can touch a chord with the majority. “He picks up issues relevant to a particular state. The kabristaan reference was very deliberately made in UP, where there is a high Muslim population. A comment like this goes a long way in polarising the atmosphere, especially during election time,” he said. On the flip side, Modi, who had identified himself strongly with the movement against instant triple talaq, has barely mentioned it since the Supreme Court struck it down as “unconstitutional” in August 2017. In the two big states that have gone to the polls since then — Gujarat and Karnataka — or in the current round of poll campaigning, Modi has talked about the issue only once, in Dhandhuka in his home state. “I am clear that on triple talaq, I will not be silent. Everything is not about elections. This issue is for the rights of women…elections come later, humanity comes first,” Modi had said on 6 December 2017. In September 2013, addressing his very first rally as the BJP’s PM candidate in Rewari, Haryana, Modi called upon Pakistan to embrace the path of peace and leave the path of bombs. Taking a dig at the UPA government for not being proactive, Modi had said: “When we were praising the work of our soldiers in Uttarakhand (referring to the floods that year), Pakistan was killing our soldiers. And see the misfortune: The defence minister said people dressed in Pakistan Army uniform came. Imagine how our soldiers would feel. By December 2017, while campaigning in Gujarat, Modi raked up a controversy when he said that Pakistan was showing undue interest in the Gujarat elections. “Pakistan Army’s former director-general Arshad Rafiq said that in Gujarat, Ahmed Patel (the political secretary to former Congress president Sonia Gandhi) should be made the CM. Why is Pakistan’s senior retired army officer exercising his brain on the Gujarat election? He has also used the September 2016 surgical strikes to further attack the Congress on Pakistan. The Modi government’s two high-impact economic decisions, demonetisation and GST, have had quiet burials. In the UP elections, which came less than four months after demonetisation, Modi made frequent mentions to it, but subsequently, he has only made fleeting mentions of it in Karnataka and MP. The PM has never spoken about GST in any election speech, ever since it was introduced on 1 July 2017. In 2019, the chief ministers will have to do their share of the heavy lifting. One doesn’t see many of the calibre of Shri Shivraj Singh Chouhan. terms consecutive regime of UPA led by Dr.Manmohan Singh paved the way for NaMo to tempt the masses into his trap with ploys, lies, rhetorics and theatrics ! The natives believed in whatever TALL- UTOPIAN promises NaMo made during his poll speeches ! The unexpected and unprecedented confidence reposed by the electorate in BJP under his leadership went to his head ultimately began turning his head ! The clear cut mandate in BJP’s favour prompted him to nourish dreams of ruling the nation for decades together without honouring poll promises and doing anything worthwhile for the progress, advancement and development of India. In absence of any opposition or challenge to his leadership, he in league with BJP Chief Amit Shah started living in fools’ paradise they are invincible but ironically Delhi and Bihar Assembly Polls soon after dashed all these hopes and allusions to the ground ! Afterwards, the duo continued enjoying mixed fortunes in the polls that followed ! After almost more than four and half years of rule now both NaMo and Shah stand very badly exposed ! There is a deep credibility and public trust deficit crisis is haunting them because on ground level they miserably failed to come upto the expectations of the masses not honouring tall promises on black money, employment generation, eradication of poverty, farmers distress and all round progress and development of the nation ! The year 2018 and ensuing 2019 present a very dismal, challenging, confusing, desperate and panicking scenario for the duo. They are now at their wits end running short of ideas to coin catchy and attractive terms, expressions and phrases ! The people have already seen through the past NaMo NaMo tricks and ploys- Sab Ka Saath Sab Ka Vikas, Acchhe Din, Rs 15 Lakh in every account, two crores jobs every year and what not ? There is a failure on the part of Modi on two accounts ! First one is the failure to deliver the goods as fondly promised and the second one is the failure to find new and innovative issues- expressions this time to befool public to be in the hot seat for the second time ! For want of issues, NaMo has to be bitter and sarcastic in state poll speeches just lambasting Congress for Dynasty Rule factor because he has not anything of his own or of BJP to sell anymore ! He wanted to annihilate the Congress, he tried that all of his tenure, and is now sounding like a bitter and defeated man, at least on that front.